By the way to Ostrów, in Lamki, in an open field there was a small brick chapel with Mary Immaculate . Behind the statue there was a barely visible figure of Sorrowful Christ. The inhabitants of Lamki took care of the chapel. The girls carried flowers and sang songs. One night during the occupation some German soldiers shattered the chapel to the very foundations. In the morning the residents carried out the rubble - there was not a trace of the chapel. The figures, which were picked up, were stored in the houses during the occupation. After the war, the sculpture of Sorrowful Christ was brought to the parish church in Gorzyce Wielkie, where it is today. The figure of Christ is the work of Master of Masanów. 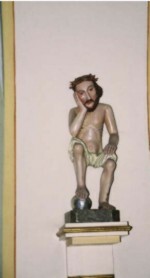 Sorrowful Christ from the chapel in Lamki.